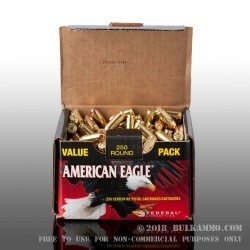 A great range day starts with an excellent deal on your favorite 40 cal range ammunition. This is a good place to start. 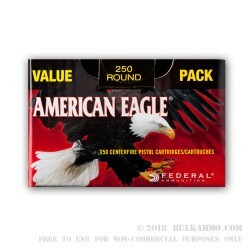 The .40 S&W load by American Eagle, a Federal brand line that offers reliable performance and consistent velocities meaning you will hit your target every time and won’t have to work for it like the cheap imports without the same quality control policies in place as the Federal eco-system. 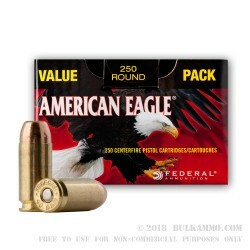 This is an exceptional value for the money, with the per round cost reduced down heavily and the top quality precision and production quality means you get what you need at the range. 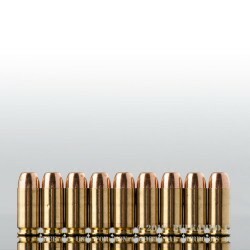 Your gun will function, and your patience won’t be tested. 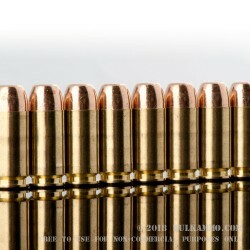 The best reflection on the performance of a range round is the consistency with which it can be fired without drama or misfires/failures to feed/failures to extract. 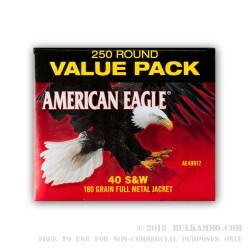 Enter American Eagle, who has a reputation for just being a good silent partner at the range, where its greatest perk aside from its very reasonable price point, is that it just doesn’t stop working. No drama, no difficulties, just Bang, Bang, Bang. 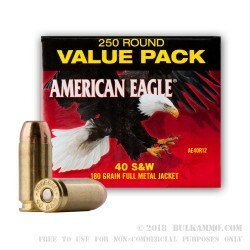 This is a 250 round Value pack that is loose packed in a substantial cardboard box and the load features a 180 grain flat nosed FMJ .40 S&W projectile with a brass, Boxer primed, reloadable case.